Over the last decade, the Democratic Party has changed its tune, and started trying desperately to woo Latinos. Today, leading Democrats overwhelmingly support a path to citizenship for undocumented immigrants, and are using executive orders to halt deportations, while Republicans, led by Donald Trump, continue to demonize Latinos and promise harsh countermeasures to stop undocumented immigrants from entering the country. By now, it’s a cliché in American politics that Latinos are a political force to be reckoned with, and that the nation's rising Latino population will reshape the country’s politics for decades to come. But we wanted to study how Latinos are changing American politics. So we explored multiple datasets which collectively include thousands of Latino respondents. We found that Latinos are more supportive of Barack Obama’s progressive agenda than non-Hispanic whites, and that Latinos are more supportive of action on climate change and immigration. Even on social issues, where the popular conception is that Latinos are relatively conservative, Latinos are actually quite a bit more liberal than non-Hispanic whites. Latinos already reside in many key swing states: In Arizona, Latino voters were central to the electoral defeat of staunchly anti-immigrant Sheriff Joe Arpaio. In Nevada, voters this year elected both the first Latina U.S. senator and the state's first Latino congressman. Similar events will be seen in many other states. As Latinos rise as a share of population and the electorate, they will increasingly reshape the political system. Latinos are more supportive of Democrats than of Republicans. 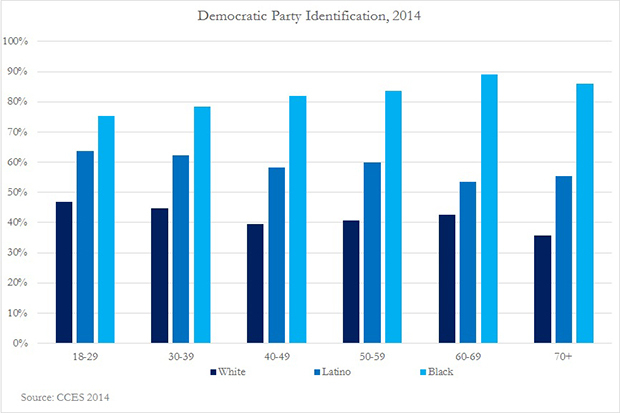 Even before Trump emerged on the national scene, about 60 percent of Latinos supported the Democratic Party, across all age groups. Young Latinos are more supportive of Democrats (64 percent identify as Democrats) than older Latinos (55 percent), and are far less supportive of Republicans. While a bit more than a third of the oldest Latino cohort support the GOP, only 17 percent of Latinos overall identify as Republican. There is a strong possibility that Trump will drive Latinos further away from the Republican Party. Trump has incredibly high unfavorable ratings with Latinos, particularly Spanish-speaking Latinos, likely stemming from his attacks on undocumented immigrants. Barack Obama’s policy agenda faced almost unprecedented opposition, and what eventually survived was under continued assault. His policy proposals were only somewhat popular with non-Hispanic whites, but were overwhelmingly supported by Latinos. Majorities of Latinos supported the Dodd-Frank financial reform bill, the Waxman-Markey climate change bill, the stimulus package, the Affordable Care Act and the State Children’s Health Insurance Program. 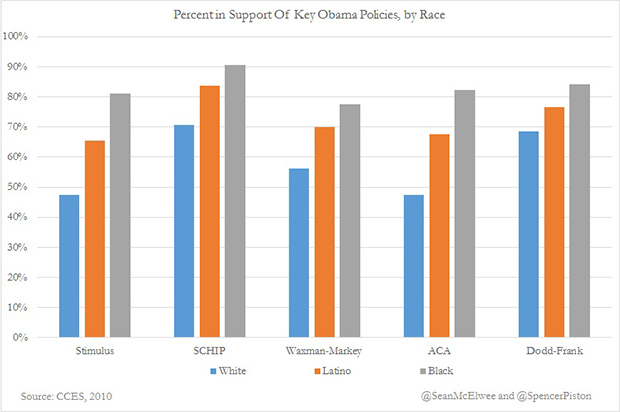 Whites were less supportive of all the initiatives, and the majority of whites opposed the stimulus and ACA. Latinos, especially younger Latinos, are generally supportive of action on climate change. At the same time, many Republican Party elites have continued to deny its existence. With the exception of Sen. Lindsey Graham of South Carolina, every Republican presidential candidate denied the reality of climate change. In 2007, Sen. John McCain introduced legislation co-sponsored by then-senator Obama to implement a cap-and-trade program. Today, more than half of Republicans in Congress deny climate change, and more than half have signed a pledge promising to stop action on climate change (even though many live in districts supportive of climate change). Latinos are far more supportive of immigration reform than are non-Hispanic whites and African-Americans. Although the GOP attempted to implement immigration reform under George W. Bush’s presidency, this attempt floundered. Under Obama, a brief attempt at immigration reform (led by the “Gang of Eight” in the Senate) flamed out after attacks from the Tea Party base, racist vitriol and strong opposition to Obama. Now, Republican politicians openly oppose immigration reform. 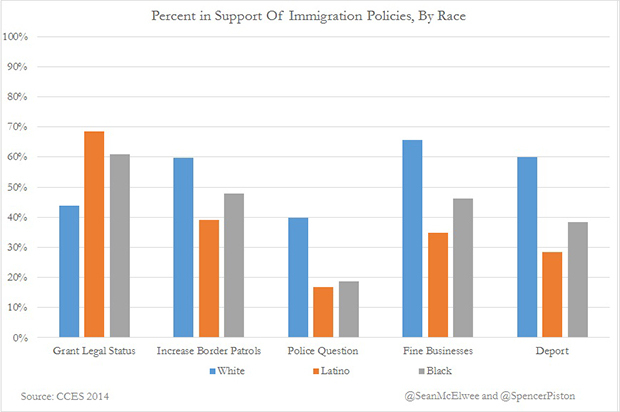 This is inconsistent with the preferences of most Latinos; as the chart below shows, Latinos are far more supportive of immigration reform than white and African-American respondents. 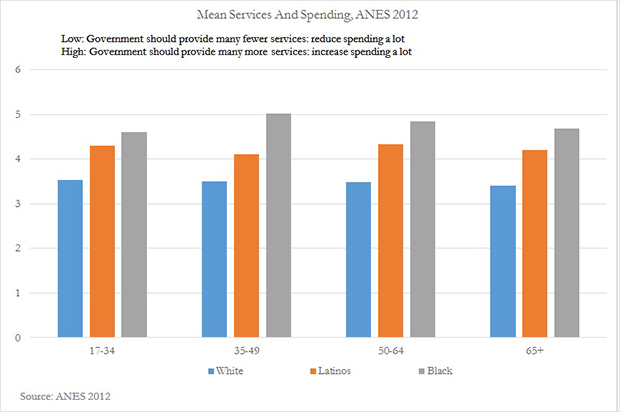 On issues related to budgets and and government spending, Latinos are also more liberal. To explore attitudes toward austerity we explored two questions in the 2012 American National Election Studies survey: The first asks respondents whether they want more services or fewer, the other whether the government should guarantee jobs or let individuals get ahead on their own. (We standardized both questions, so a higher score is a more liberal attitude.) On both of these questions, Latinos are more liberal than non-Hispanic white people but less liberal than black people. Many have argued that Latinos are “natural conservatives” who would fit well with the Republican Party, citing the purported religious and social conservatism of Latinos. Juhem Navarro-Rivera, a political scientist who studies Latino opinion and works as a senior policy analyst at Demos, notes that Latinos are more supportive of abortion and gay rights than are Republicans. In addition, Navarro-Rivera notes that Latinos are increasingly irreligious, and that both religious and irreligious Latinos are strongly supportive of aid to the poor. Our analysis of CCES is consistent with this argument. Because Latinos in our sample are a good deal younger, and young people tend to be more liberal on social issues, we examined attitudes across age cohorts. 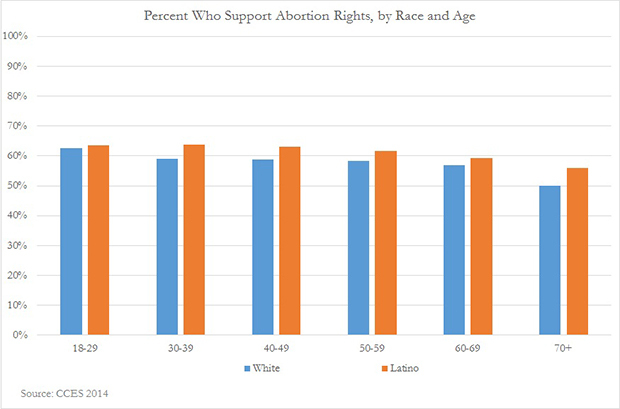 Across all age groups, Latinos are slightly more socially liberal than whites, particularly on the issue of abortion. The majority of Latinos reject the Republican Party’s position on both issues. It is widely known that many white people subscribe to negative stereotypes about black people. Less widely known is that many Latinos also endorse these negative stereotypes. For example, in the 2012 ANES, respondents were asked to rate racial groups on a 1-7 scale, where “1” represents “hardworking” and “7” represents lazy. Latino respondents rate black people, on average, at 4.2; near the midpoint but slightly toward the “lazy” end of the scale. This is similar to white respondents, who rate black people at 4.0 on average. Black people themselves, meanwhile, rate their own group at 2.8: substantially closer to the “hardworking” end of the scale. Respondents were also asked to rate racial groups on a similar scale, where “1” represents “intelligent” and “7” represents “unintelligent.” Here again we see that Latinos and non-Hispanic whites hold similar views of black people; the average rating of blacks is 3.5 among Latino respondents and 3.6 among white respondents. In contrast, black respondents rated their own group more favorably, at 2.6. Generally speaking, then, Latinos endorse negative stereotypes about blacks at similar levels to whites; furthermore, research shows that these negative stereotypes are consequential for Latinos’ opinions about racial policy. As one of us (Piston) has shown, more light-skinned Latinos are more supportive of Republicans. The other (McElwee) showed that high-income Latinos are more likely to support a conservative agenda and that Latinos do not consider their racial identity as important as African-American voters do. As mentioned earlier, in Nevada, where a majority-Latino culinary union campaigned and canvassed heavily, Hillary Clinton carried the state, and the first Latina senator was elected. While it’s easy to see a future in which Latinos vote heavily Democratic (as they often already do), there is a plausible scenario in which a Republican Party pursues some version of George W. Bush’s strategy, passes immigration reform and wins over significant numbers of Latinos. That seems increasingly unlikely, given Donald Trump’s toxic and racially charged campaign rhetoric. Early on in his campaign, he slandered undocumented immigrants from Mexico as rapists and drug dealers. If Clinton’s “my abuela” blogpost was tone-deaf, Trump’s taco-bowl tweet was farcical. Navarro-Rivera tells us, “The narrative that Latinos are natural conservatives was always false. If Republicans want to win over large numbers of Latinos, they’d have to stop being Republicans.” Our evidence suggests that Navarro-Rivera is correct -- Republicans cannot easily win over Latinos without altering their core message. The future does not bode well for Republicans either, as younger Latinos have more negative feelings toward the GOP and Trump than older Latinos do, and are far less likely to identify as Republican.